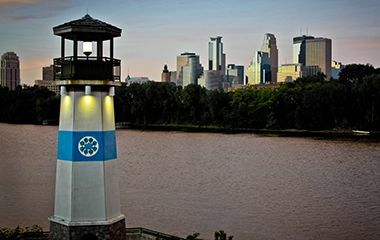 Boom Island Park	Located on the historic Mississippi riverfront with stunning views of the Minneapolis skyline, Boom Island Park offers a picturesque site for weddings and picnics. 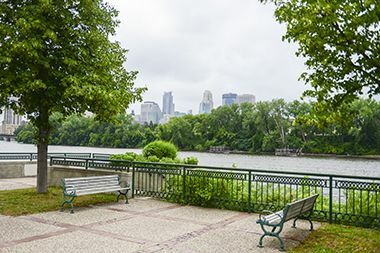 Boom Island Park is adjacent to B.F. Nelson Park, and is connected to Nicollet Island Park by a pedestrian bridge. Name: The park gets its name from the island that it once was. The island was named for the booms that were used to separate logs floated down the Mississippi River to sawmills powered by St. Anthony Falls. Each log cut along the tributaries of the Mississippi River was “branded.” Each lumber company put is own stamp on the end of its logs and they were separated using those stamps and directed to the proper saw mill by men working from Boom Island. The sawmills at the falls were eventually replaced by flour mills. 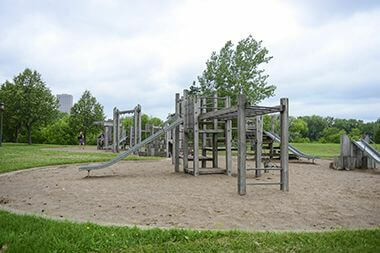 The land that had ceased to be an island decades earlier due to a build up of silt and sawdust was purchased by the park board with funds from the state legislature through the Metropolitan Council in 1982. The land was purchased from a construction company for $2.6 million. 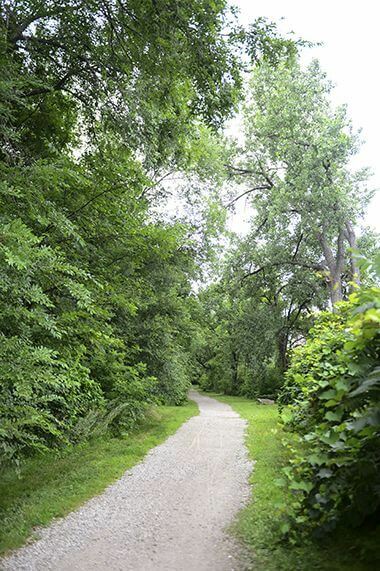 The land had been targeted for acquisition in the 1978 plan for the development of the central riverfront as a park by the Riverfront Development Coordinating Board (RDCB), which was chaired by park commissioner Ole Olson. The RCDB considered plans to convert the land to an island once again, but decided against it due to the cost. The first phase of the park was dedicated in 1987 shortly before the completion and dedication of James I. Rice Parkway across the river. 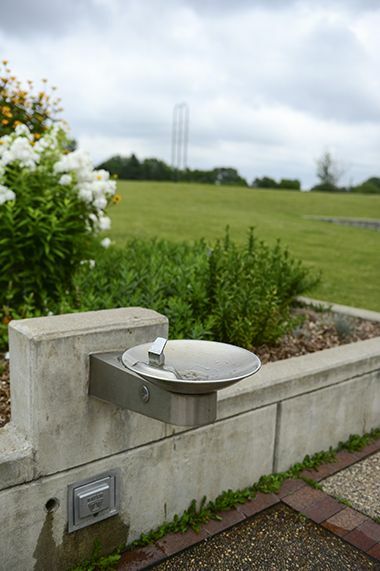 The park was designed by Ted Wirth, grandson of former park superintendent Theodore Wirth. At the time Ted Wirth was a landscape architect based in Montana. The park was mostly completed in 1988. The park featured a marina, boat dock, a landmark miniature lighthouse in the river, picnic shelters and a playground for small children. An old railroad bridge from Boom Island to Nicollet Island was converted into a bicycle and pedestrian bridge. 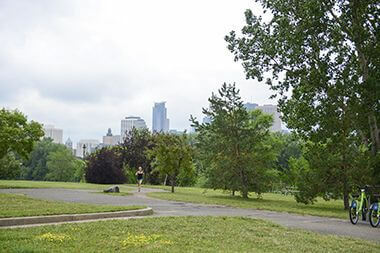 The acquisition and development of the park was seen at the time as an important spur to redevelopment of the Central Riverfront, along with Nicollet Island, Historic Main Street and Father Hennepin Bluffs on the east side of the river and James Rice Parkway and Mill Ruins Park on the west side. In 1988 the paddle boat Anson Northrup began using the docks at Boom Island Park to board passengers for river cruises. That boat was later replaced by the Mississippi Queen. In 2012, the park board stopped riverboat cruises from passing through the St. Anthony Lock to help impede the spread of Asian Carp above St. Anthony Falls. Riverboard cruises no longer operate out of Boom Island Park. 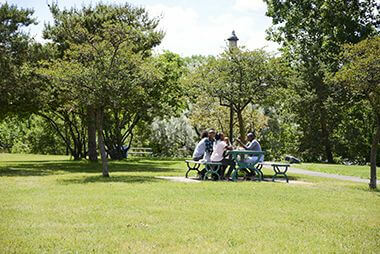 A complete redesign of the park began in 2011, with new landscaping and paths intended to establish a greater connection to the river. The plaza along the river and the marina were extensively rehabilitated. 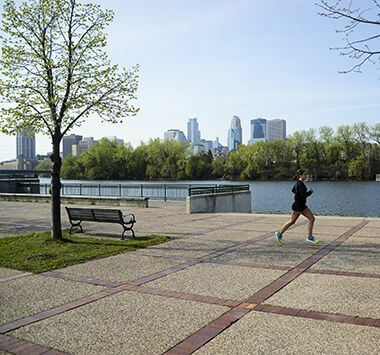 In 2013, a Nice Ride bicycle rental kiosk was installed at the park and in 2016 a Paddle Share kayak rental station debuted near the bridge connecting to Nicollet Island. Boom Island Park is contiguous with B. F. Nelson Park to the south and is part of Central Riverfront Regional Park. 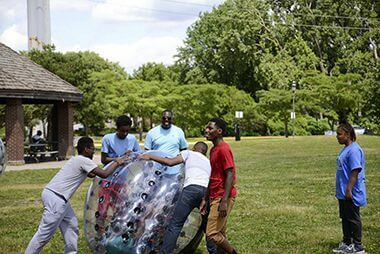 Youthline is a year-round program that provides mentorship at participating recreation centers. Learn how to reserve space at boat docks throughout the parks. 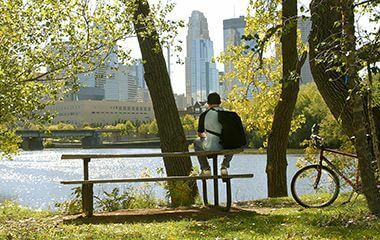 Take in views of Downtown Minneapolis and the beauty of the Mississippi River. 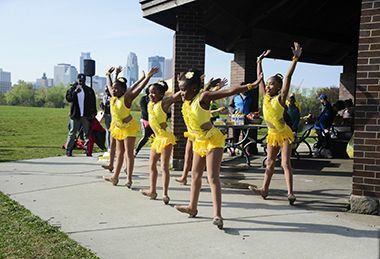 Plan your next event in the park. 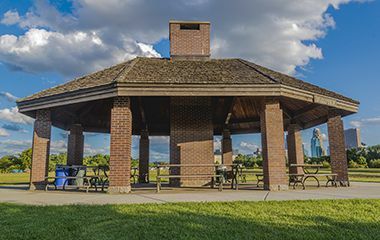 Reserve one of three covered picnic shelters, each with grills and electricity available. Shelters located at 800 Sibley St. NE [PDF]. Take a break at Boom Island Park. 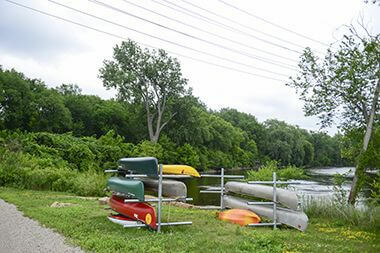 Canoe and Kayak Racks are located on the Mississippi River. 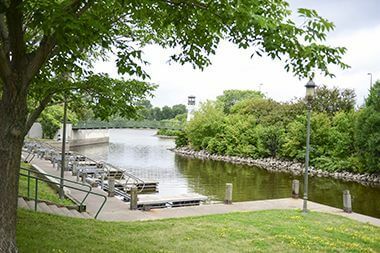 Boom Island features three reservable picnic shelters as well as picnic tables. One of Boom Island's landmark features is the miniature lighthouse that sits on the north side of the park.